Far from a passing trend, the polka dot is here to stay. Take inspiration from a dotty bikini clad Marilyn Monroe or the vibrant ruffles of a patterned Flamenco dress and sprinkle some spots through your wardrobe with our classic Mini Box Bag adorned in charming polka dots. The spotty delight is made from sumptuous snakeskin, and is guaranteed to bring a splash of colour to your outfit this Autumn. 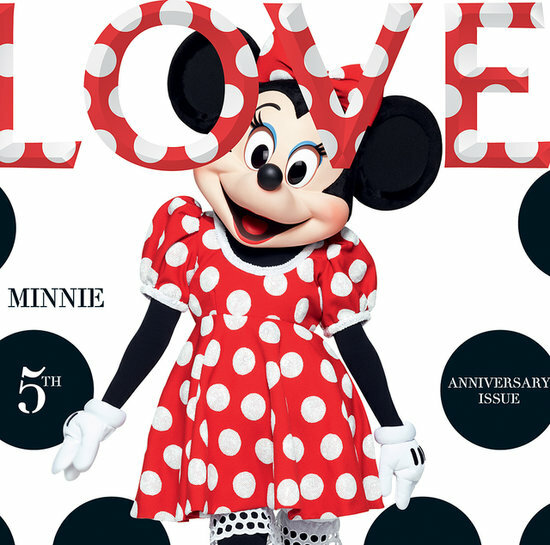 Be it a flash of print on a neckerchief or a classic monchrome dress, the humble polka dot has long been a staple motif in a style savvy wardrobe and is regularly modeled by icons as recognisable as Minnie Mouse who was the muse and cover girl for the 10th issue of Katie Grand’s LOVE magazine. Starring alongside models of the moment Cara Delevigne, Edie Campbell and Georgia May Jagger, the mouse of the moment lent her ears and polka dot bow to the fashion world this season. This playful print is not just for fictional friends however; take Kate Middleton, a woman whose wardrobe choices have the ability to create a ‘must-have’ in a matter of minutes. The Duchess of Cambridge has clearly gone dotty for the humble polka dot after sporting a black and white spotty Topshop dress at two different occasions. Worn by Kate, the print becomes a symbol of young motherhood, picnics in the park and leisurely strolls with her baby boy. Take your eyes to the catwalk however, and this versatile design takes on a whole new meaning. 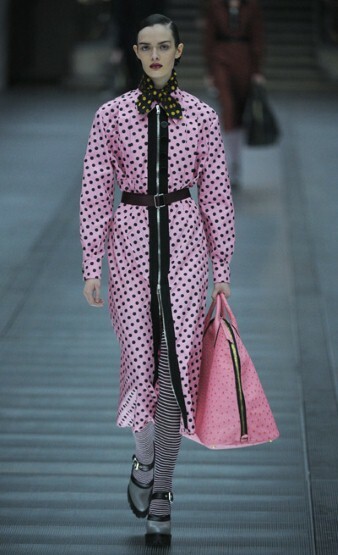 For her Autumn 2013 collection for Miu Miu, Miuccia Prada sent models down the runway in hourglass enhancing silhouettes, smattered with flashes of polka dots in the form of coquettish neckerchiefs, peeps of flirty underskirts and bold full length bomber-style coats. Despite both sporting the same print, the Miu Miu woman and the Duchess of Cambridge both alluded to entirely different imagery. Trailed across the figure hugging designs of Miuccia Prada, the Miu Miu polka dot look hinted at a strong powerful woman, who wasn’t afraid to show her playful side. 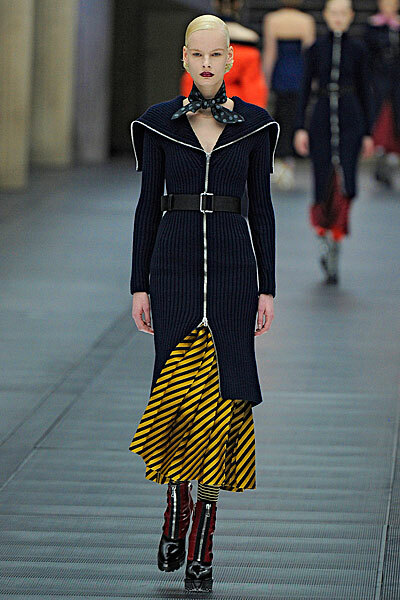 Equally, the sheer polka dot garments seen at Chloe the same season resulted in a rather tougher, urban woman than the former. Fast-forward to the recent Spring/Summer shows, and the print is still topping the list of must-wear trends. The SS14 Burberry show was a storming success as always, rarely do they produce looks that are not immediately picked up within seconds of the models hitting the runway. Mr Bailey it seems is a lover of the polka dot, as his collection for Burberry featured the spots in many different guises. From subtle lace circles that were scattered across delicate skirts and shirts, to in your face bold polka dots clashed with stripes, the new season Burberry woman will surely list Ms Minnie Mouse as her style inspiration. So, where did this trend begin? The polka dot has the unique ability of looking fashion forward, whatever era it is worn, and has been a favourite of designers from across the globe for many centuries. Cristobal Balenciaga, along with Dior, dominated Parisian haute couture after the Second World War. He was very much inspired by Flamenco dress (being Spanish himself) and often made use of spotted textiles in his garments. Fabrics and colours were the main inspiration for Balenciaga’s collections, and some of his most iconic and recognisable pieces are his polka dot adorned dresses, giving a light hearted twist to a dramatic ball gown. Canadian born designer, Arnold Scaasi was famous in the 1950’s for his distinctive silhouette; a deep décolletage and bell shaped skirt. He also was one of the first designers to create the matching dress and coat ‘look’ for evening wear. 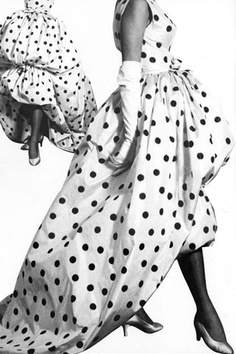 Polka dots were a signature staple that Scaasi employed in his garments and he once said; “Clothes with some adornment are more interesting to look at and more fun to wear”. Perhaps a forerunner of Mr Jacobs? Legendary avant-garde artist, Yayoi Kusama, famous for her use of polka dots in her work, has been prevalent in the art world for decades. Since the late 1950’s, Kusama has been an important influence in both the art and fashion worlds with her dramatic exhibitions and live performances. Polka dots are a trademark of her work and have more meaning to her than just a humble spot “a polka-dot has the form of the sun, which is a symbol of the energy of the whole world and our living life, and also the form of the moon, which is calm. Round, soft, colorful, senseless and unknowing. Polka-dots become movement… Polka dots are a way to infinity.” Most recently, Kasuma has collaborated with Marc Jacobs with the LOUIS VUITTON × YAYOI KUSAMA Collection. Moving into the 1980s, and the streets of New York were awash with Carolina Herrera’s polka dot adorned creations. From off the shoulder full length gowns, wedding dresses or even the packaging of her perfume range, Ms Herrera is a devout polka dot worshipper and continues to feature them in her collections today. Pingback: The Place of The Polka Dot Dress in Fashion - It's all about circles!